Some of my favorite instruments. I really enjoy the warmth, tone and feel of a good acoustic guitar. They just have this organic, natural sound that really speaks to me. I love the way that a player can really articulate a feeling with how hard or how soft they play on it, or if they play with a pick or the tips of their fingers. My goal through this is to hopefully help you see and understand some of the tools that I use, and for my musician friends to give you a detailed look at the gear that I use. 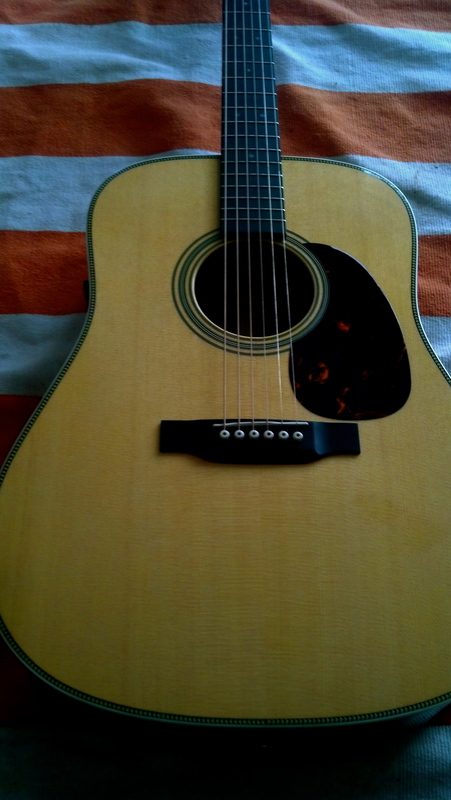 So I will start with my Martin HD-28E Retro. It is based off of a 1941 Martin guitar. Now, I have never played an actual 1941 guitar before so I have no idea how close it is to the original, but it looks nice and sounds amazing. I would probably be truly freaked out and super nervous if I had the chance to play one though. 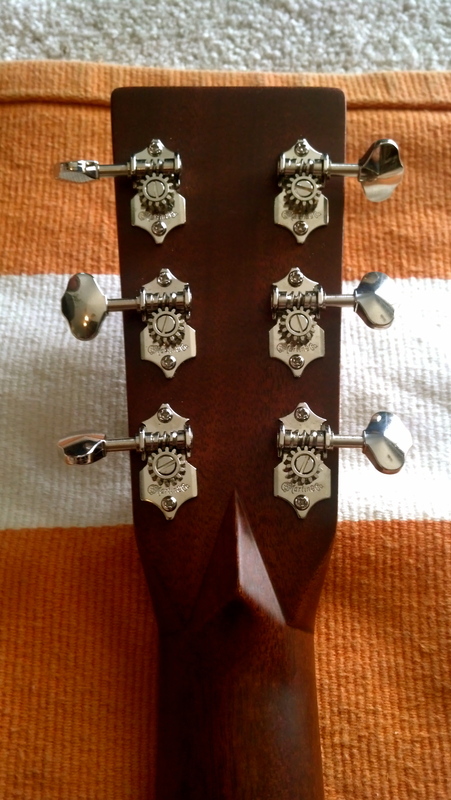 The head stock is that signature Martin Guitar Company which I really like because it is very simple and clean. I use this guitar a lot for most of my hard strumming and driving rhythms since it stays really clear and crisp at higher decibels. I will tell you, IT IS LOUD! Being a full bodied guitar, it projects the sound very well. You can wail on this thing as hard as you want and it doesn’t muddy the sound. It has a great feel and is not too big or too small. 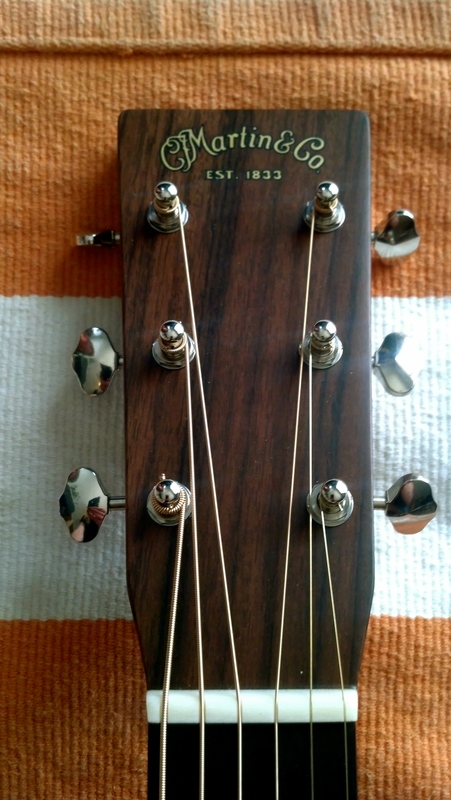 The neck of this guitar is based off of Martin’s performing artist series. My hands don’t hurt after an hour or two of playing like it has on various other guitars. It’s super comfortable to play, and hard to put down. It took me a while to decide on this particular guitar. I had a check list of things that I wanted in a new acoustic. One being a dreadnought, which means that it has sort of “D” shaped body, the right combination of tone woods, a slim neck, and a comfortable feel in my hands. Not too big or too bulky. Looks were not that important to me because I don’t really want a guitar that is super flashy. Shiny is okay, but I don’t like busyness on a guitar. I guess the word I would use to describe it is subtle or possibly vintage. 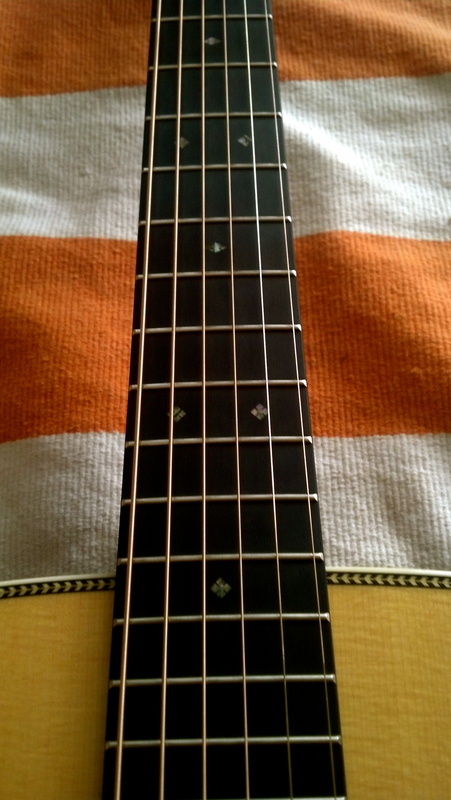 The guitar’s top is a Solid Sitka Spruce, which is kind of a standard for most acoustics. It is pretty strong but also has very good elastics which allow the guitar to sound good whether played lightly or hard. 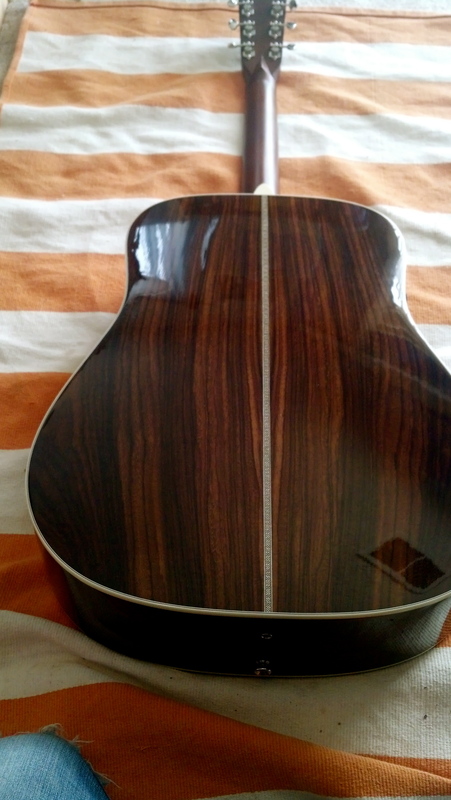 The back and sides of the guitar are made from East Indian Rosewood, which has a really broad range of sounds. It delivers good bass, mid range and treble for almost all styles of music, plus it has a gorgeous pattern and a beautiful and rich color. One of the many reasons I love this guitar is its sound, not only unplugged, but plugged in as well. Truthfully, thats where this thing really sings. While going through an amplifier or P.A. system, it just sounds amazing to me. It still has that warm, unplugged feel. Some acoustics sound terrible plugged in, but the Fishman Aura Plus system is incredible! Now, it has taken quite some time for me to dial in the tone that I really like, which is important to do because you don’t want your sound too trebly or too bassy. If it has too much bass, the sound gets really muddy and the guitar is not clear, and if it has too much treble, it can pierce the ears and be offensive. It’s a delicate balance, and one thing to keep in mind, tone is subjective. So in short, I really enjoy the ease of playability, comfort of holding it and the sounds that come from this guitar. All in all, it is a very versatile guitar that I hope to be able to play and bless others with for years to come. This is one of the tools that I use to create, write, record and play music on. The guitar has always been a great way for me to communicate without messing it all up with words. What is something that helps you to get your ideas out? I would love to hear from you! This entry was posted in Uncategorized and tagged 1941, Acoustic, Beautiful, CMF Martin, Dreadnought, East Indian Rosewood, Favorite, Guitar, HD-28E, Headstock, Martin Guitar Company, Music on May 6, 2013 by forgottenskymusic.